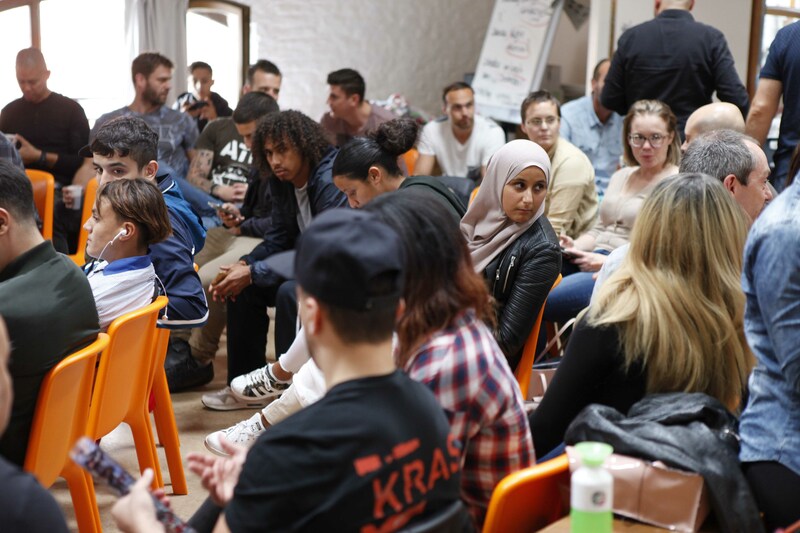 Youth, women, police, youth workers and local policy makers discussed problems young women face in Molenbeek with different identities, lack of perspective, destruction and gaps in society. IDEA NL and partners in the Netherlands and Belgium from the police and youth welfare sector organised an exchange between more than 80 youth, women and police from so called 'polarised neighborhoods such as 'Molenbeek' (Brussels), 'Schilderswijk' (The Hague) , Borgerhout and Kiel (Antwerp). This exchange is supported by Erasmus plus Youth. "Everything starts with respect between the community members. This is weak now, people react very often on the basis of ignorance and emotions. However respect will grow and strenghtened when we meet each other on a regular basis so that we get to know and understand each other. We need to spend much more time to discuss problems, ideas, tensions and to debate solutions. As Amartya Sen says; 'combined informed reasoning with informed undstanding of what is needed in the world, will support change'". "It would be therefore beautiful when neighborhoods and cities will invest in infrastructures to create bridges between police, youth, youth workers, shopkeepers and other stakeholders from different backgrounds in the neighborhoods. We need to make time and space for dialogue and debate to create this understanding among each other. And it is also very important to drink tea together and to say 'hello' to eachother, who ever you are or whatever role you play." 'Debates and dialogues can help us in this to help us to open up and to share our own perspective on current problems, to listen carefully to other opinions and to be better informed and understand more deeper the complex problems we face. This deeper improved understanding of the different perspectives on problems will help us to reason well informed and to seek to better solutions for the common good'. Those and more points will be discussed when the participants meet again in the Hague in the beginning of 2018.
adressing questions about polarisation with small scale debates and dialogues to improve mutual understanding and well informed reasonable thinking and debates.